The right word is incarceration, Mas Hashimoto said, not internment. 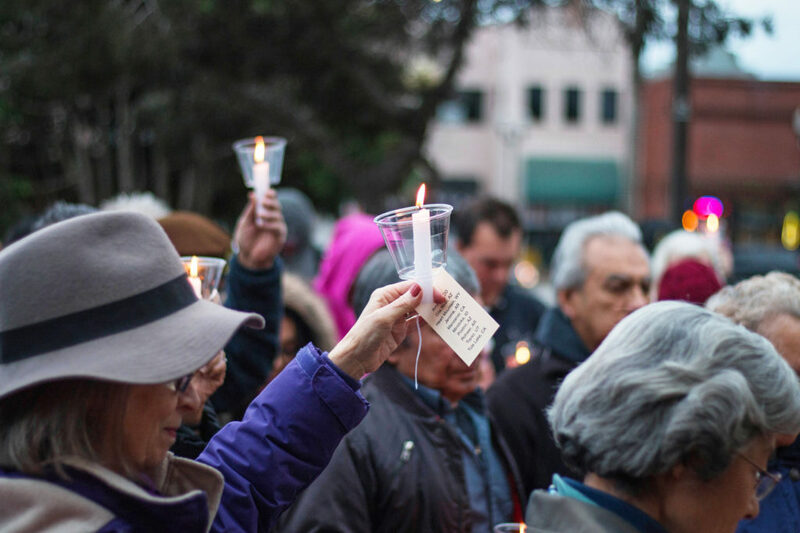 A candlelight vigil in Watsonville Plaza on Sunday allowed Hashimoto and a crowd of about 30, including Watsonville Mayor Oscar Rios, Watsonville Police Department (WPD) Chief David Honda and several other community leaders, to commemorate the 75th anniversary of Executive Order 9066. The executive order led to the internment of over 100,000 Japanese Americans. 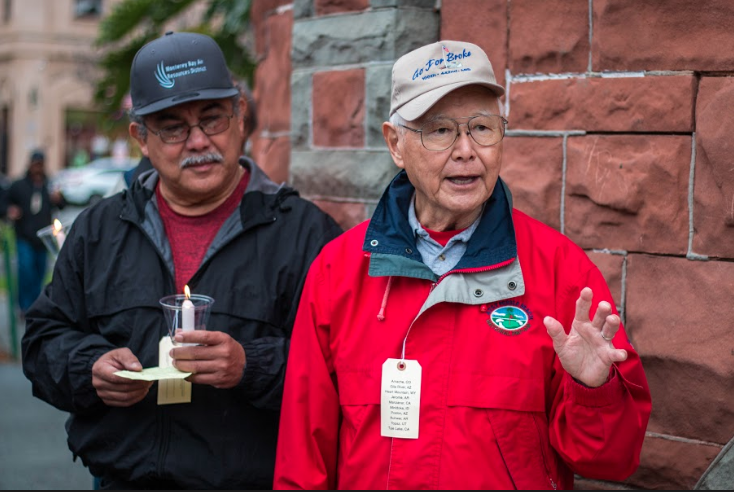 The event, organized by the Watsonville-Santa Cruz chapter of the Japanese American Citizens League (W-SC JACL), was a moment of remembrance and a call to action. Attendees held white candles and wore luggage tags similar to the ones 117,000 displaced Japanese Americans were forced to wear. Hashimoto, a member of the W-SC JACL, wore his luggage tag with the original number he received upon incarceration — 12524 D. The war divided his family, forcing two of his brothers to fight against Japan while another fought for it. Although it was difficult, he said, his family’s division was not unique. The nearly 120,000 people affected by Executive Order 9066 — about twice the size of the city of Santa Cruz — were sent to one of 10 internment camps in the U.S. Almost two-thirds of them were American-born citizens and over half were children. In Santa Cruz County alone, over 1,300 Nikkei people — Japanese emigrants and their descendants — were displaced, according to the JACL website, 71 percent of whom were U.S. citizens. It wasn’t until 1988 that the U.S. government issued a formal apology and $20,000 in reparations to each survivor, totaling $1.6 billion. With President Donald Trump’s recent executive order banning travelers from seven predominantly Muslim and war-ridden countries, many fear the U.S. has not yet learned its lesson. Alice Yang and Alan Christy, provosts of Stevenson and Cowell Colleges respectively, attended the commemoration to thank and learn from Mas Hashimoto and acknowledge the importance of America’s past. Hashimoto is a guest speaker in their Memories of WWII in the U.S. and Japan history course every year. Watsonville Mayor Oscar Rios spoke of the city’s fear about Trump’s immigration policies and vowed to never let something like Japanese internment happen again. Rios will hold an open forum for undocumented residents to ask the city council about the effect federal immigration policies may have on Watsonville’s undocumented population. The forum will attempt to ease fear about deportation and immigration policies. WPD vowed not to aid federal agencies in immigration efforts, because Watsonville is a sanctuary city. Yet, WPD Chief David Honda urged the crowd to remain active and aware of current politics. The candlelight vigil strung together healing and activism, with those who spoke of the arduous journey from home to barbed-wire barracks and those who called upon attendees to remember the injustice and to never forget. Next articleWhat’s Next, Santa Cruz?